Every November, OSHA released its annual top-ten violations list. For the seventh consecutive year, respiratory protection – standard 1910.134 – finished at no. 4. Respiratory protection regulation stands as the easiest with which to comply, yet many employers continue to violate its policies. According to OSHA, approximately 5 million workers in 1.3 million U.S. workplaces fall within the respirator compliance standard. Of the 12.7 million people diagnosed with cancer each year, anywhere from 381,000 to 762,000 diagnoses stem from prolonged exposure to workplace carcinogens. Most companies mandate respirator usage on job sites that contain hazardous materials. In fact, OSHA requires in standard 1910.34(a)(2) that “a respirator shall be provided to each employee when such equipment is necessary to protect the health of such employee.” Too many supervisors stop reading after that sentence, which is a critical and potentially deadly mistake. In order to comply with this section, employers must assess the respiratory hazards and determine their contamination level – either with objective data or mathematical approaches – in order to select the proper NIOSH-certified respirator. There are two main types of respirator: Air-purifying and atmosphere-supplying. Additionally, variations exist for each: Tight-fitting or loose-fitting. It’s crucial for employers to choose the right ones. That starts with knowing the OSHA Permissible Exposure Limits (PELs) for each substance in a given workplace, if available. There are 500 established PELs and, while most are based on 8-hour time-weighted averages, many include other factors, such as ceiling and peak limits. Inaccurate job site evaluations may lead to selecting incorrect respirators. That mistake potentially exposes employees to chemical hazards and toxic substances. Not all worksites require respirators. Though, in many cases, the employer either provides one. or allows the employee to use his/her own – so long as respirator’s usage does not create hazards. Under those circumstances, section 1910.134(c)(2)(i) requires that the employer provides proper respirator-use information, and implements a written respiratory program. The only exception to this rule is when an employee voluntarily uses a simply dust mask. The program must include information that helps the employee determine whether or not he/she is healthy enough to use the respirator; that it is properly cleaned, stored, and maintained; and poses no threat of danger. A common misconception of respirator fit test is that it’s only required upon hire. Respirators must conform to one’s face shape in order to work properly. A simple weight change may create inadequacies for a tight-fitting respirator. Additionally, if the employee or his/her supervisor notices any physical changes that could affect the fit of the respirator – an increase in facial hair, facial scarring, and/or, as mentioned above, an obvious change in body weight – then additional fit tests must be performed. *Masks used voluntarily in non-hazardous areas are not required to be fit-tested. Per secion 1910.134(c)(1), employees must develop a written respiratory protection plan when respirators are necessary to protect the health of employees in a workplace. Also, a trained supervisor must implement its policies. A compliant plan includes worksite specific procedures, such as selecting the proper respirator; medical evaluations; fit testing; cleaning and storing; and training the employees in potential hazards and proper respirator use. The supervisor keeps his/her company in compliance by updating respiratory protection information consistently. 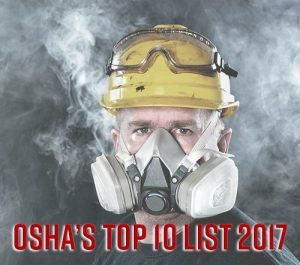 Outdated programs lead to workplace hazards and, as depicted by last year’s statistics, OSHA citations. Most employers know that employees need to wear respirators when hazardous chemicals, dusts, and pollutants fill the air in their workplaces. Many also know which respirators to use, and to schedule fit tests annually. Unfortunately, one section of the respiratory protection regulation seems to get overlooked all too often. OSHA mandates medical evaluations prior to respirator usage, as referenced several times in the respiratory standard. Yet, the most violations in 2016 came from this section. Wearing a respirator makes breathing difficult, especially for older and/or asthmatic employees. Respirators may also impair vision and/or trigger claustrophobia. Do not hold off on medical clearances until your employee passes out or suffers from a panic attack. It’s not only the right thing to do, it’s required. When it comes to workplace safety, it’s critical that employers remain proactive, not reactive. The well-being of your organization depends on it.